How does UofL hospital compare to other hospitals? The University of Louisville is going to try and make a case that it has unique requirements that will require additional non-patient revenue to fix. Specifically, they are asking for more state money, or alternatively, permission to partner with an outside business entity that is willing to give them more money. The claim will be made they are caring for a disproportionate share of nonpaying patients, and do not have enough profitable patients to subsidize the losses the way other hospitals do. This is a reasonable argument to make but it is an incomplete one. The University’s problem will not be fixed by money alone. There are a host of other issues that must be addressed simultaneously. I have begun to discuss these elsewhere. There are 3502 acute care hospitals that participate in the Medicare program. Of these, 1047 are teaching hospitals, and 601 are large urban teaching hospitals like the University of Louisville Hospital. It would be easy for the University or its consultants to pick and choose hospitals to compare with that would bolster its case. Picking your own benchmarks is one way to make yourself look good, or in this case bad. Much of the University’s credibility will hinge on the choice of comparable institutions. Fortunately, there is an ocean of comparative data available that I believe helps put things in perspective and can provide a starting point for a broad-based study of our medical school and its principal teaching hospital. I will try to present such information on the Institute’s website. Such analysis often challenges popular wisdom. For example, teaching hospitals get billions of dollars of special funding from Medicare (and Medicaid) solely because they have medical residents on their wards. These Direct and Indirect payments for Graduate Medical Education (interns and residents) increased substantially over the years as a result of effective lobbying. It was argued from the start that teaching hospitals deserve more money because they have extra expenses related to faculty salary, inefficiencies of care, and for other reasons that may or may not be relevant today. Federal analysts estimate that Medicare pays teaching hospitals twice as much for graduate medical education than the actual cost of those programs to the hospitals. Not to be denied, the teaching hospital lobby continues to argue that they are entitled to the extra money because of their disproportionate service to the poor. Is it in fact true that teaching hospitals take care of more of the poor than non-teaching hospitals? I was frankly surprised when my first attempt to find out showed that in fact, the proposition does not appear to be true. Every year, Medicare publishes a huge amount of information about its participating hospitals called its “Impact File.” Medicare itself uses the data to determine the financial impact of any changes in Medicare law or regulations. The file includes three measurements relevant to our discussion here. To estimate the amount of indigent care provided by a hospital, Medicare calculates its Disproportionate Share Index (DSH): roughly the percent of bed-days filled by Medicaid patients. Medicare uses a hospital’s DSH Index as a proxy for total indigent care and to determine if a hospital qualifies for an additional special add-on for indigent care. (A hospital that does not serve many Medicaid patients is unlikely to serve many poor people either.) To measure the “teaching intensity” of a given hospital, Medicare calculates a Resident to Bed Ratio. (Residents are a money–maker for a hospital. Some hospitals actually have more residents than they do beds!) Finally, the Impact file lists the percent of bed-days filled by Medicare patients for a given hospital. In 2011, of the 3502 acute care hospitals participating in Medicare, 1047 are teaching hospitals. Of these teaching hospitals, 601 (including University Hospital) are termed large urban hospitals; 385 are classified as other urban hospitals, and 61 are considered rural hospitals. 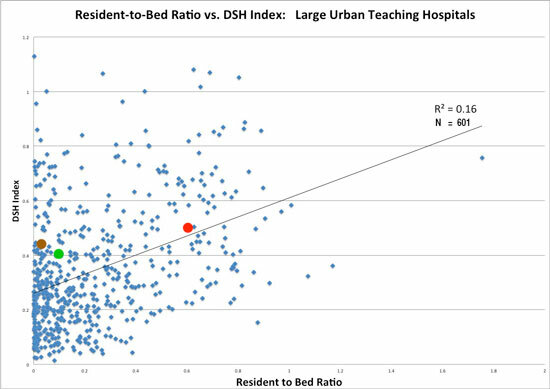 If it were true that teaching hospitals took care of more poor people, one would expect that the higher the resident-to-bed-ratio, the higher would be the DSH index. In fact, when I plotted these two variables for all hospitals, there was essentially no relationship between teaching intensity and the DSH index: it was almost random. The large majority of acute care hospitals have few or no residents and take care of very few Medicaid patients. On the other hand, there are very many non-teaching hospitals taking care of huge numbers of the poor, and conversely, many intensive teaching hospitals taking care of very few Medicaid patients and by inference, fewer of the poor. To make the comparison more relevant to University Hospital, I repeated the analysis limited to large urban teaching hospitals. (See above.) The results were essentially the same. There was no statistically significant relationship. Only 16% of the variance could be explained by teaching intensity. The red dot in the graph above represents University of Louisville Hospital: it is right in the middle of the pack. For these large urban teaching hospitals, most of the data points on the left side of the graph overlap in the area of smaller numbers of residents, and smaller amounts of care to the disadvantaged. There is no question that University Hospital cares for many Medicaid patients and medically indigent, but it is not alone, even here in Louisville. The green dot represents Norton Hospital’s aggregate numbers, and the brown, Jewish Hospital/St. Mary’s. All three care for similar numbers of Medicaid patients. Baptist Hospital East does not appear on the plots because it is not a teaching hospital. Included in the table below are the percent Medicaid bed-days (from the DSH Index) and the percent of bed-days filled by Medicare patients. It is striking that of all the acute–care hospitals in the state, our three downtown hospitals comprise 3 of the 5 hospitals in the state with the lowest Medicare bed-days. The other two are University of Kentucky Hospital, and Bourbon Community Hospital. UofL is dead last in its proportion of Medicare patients. I add the figures for Medicaid and Medicare and calculate the estimated percent bed-days not covered by Federal health insurance. What might a policymaker or community representative make of this information? More to today’s point, what do I make of it? For all the complaints (mostly from conservative doctors) about socialized medicine, it is clear that our major Louisville hospitals are heavily dependent on Federal Health Insurance. Medicare pays more than Medicaid. So, why are Norton and Baptist apparently doing well, and University and Jewish/ St. Mary’s on the rocks? Bad luck? Bad management? Bad patients? Surely what makes up the non-Federal 20-30% of the payer mix (40% in the case of Baptist) must have something to do with it. Norton’s Kosair Hospital for Children probably pulls down Norton’s Medicare percentage because children are generally not covered by that program. UofL’s Medicare percentage is very low and I would have attributed that to the fact that University has not been the hospital of choice for insured patients or their physicians. I do not know much about the UK Hospital except that it seems to be thriving with numbers of Federally insured not that different than UofL’s. Baptist has relatively few Medicaid patients and correspondingly more Medicare patients. I am surprised that Jewish/ St. Mary’s has such a high proportion of Federally insured. Maybe that is a kiss of death, but hospitals should be able to make a profit on Medicare. Non-Federal Health Insurance and Self Pay. Some of the non-Federal patients have private health insurance purchased individually or through their employer. These are the cash-cows of the hospital world. Baptist is no-doubt making hay in this department. My guess is that UofL Hospital does not do so well attracting such patients. Included in insured group are the underinsured who may have substantial copays, deductibles, and out-of-pockets to pay. These people frequently go bankrupt themselves and have the potential to take their hospitals down with them. Patients with no health insurance at all are euphemistically called, “self pay,” but these folks include both the “top and bottom percent” of our society: people wealthy enough not to need insurance, and the very poor who have little or no ability to pay their hospital bills. I do not currently have additional information about the non-Federal payer mixes of our area hospitals. My guess is that UofL Hospital does indeed have a significant number of no-pay and partial-pay patients, but so do its sister downtown hospitals. I await more complete information, but from what I know, this is not a problem that is going to be fixed by simply throwing more money at it. I concede that Obama-Care or not, we are going to have a different healthcare system in the future. (The future is by definition always different.) Things will be done differently by all hospitals. In the past 12 years, hundreds of millions of dollars have been given by the state to UofL’s academic medical center. How have things gotten so bad so quickly at University Hospital that hundreds of millions more are urgently needed? There are unresolved issues of quality of care, abandonment by faculty, public vs. private hospital status, transfers of money to University coffers while the hospital starved, and more. I say to the University of Louisville and its hospital, “Talk to us also about these other issues and what you plan to do about them before you ask us to bail you out again.” The University cannot do this by April as it hopes. •Selected elements of the 2011 Medicare Impact File for Kentucky Hospitals is available here as an Excel file. (Right click.) Includes variable description. Contact me for help. Previous Previous post: The Cardiac Gloves Come Off!